How Can I Filter the Calendar? 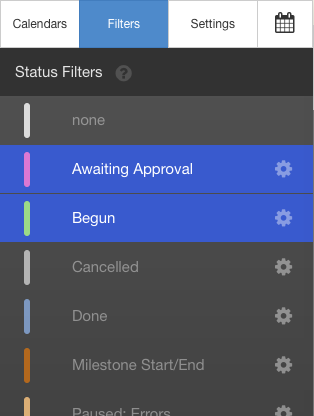 Filters help you focus on a subset of the events in a busy calendar. They're available on the Filters tab in the left-hand status area. The main filters are "Statuses" and "Resources" though you can rename and change their contents easily (more on status here and on resources here: resources). You can also show and hide events by selecting different calendar sources on the "Calendars" tab of the sidebar. The text filter works across all your calendar sources and across all your fields, so typing "Bill" in there will find events where "Bill Smith" is a related contact or account, is mentioned in the title, or is a resource for that event. The text filters support all kinds of logic and comparison operators. More here: filter options. 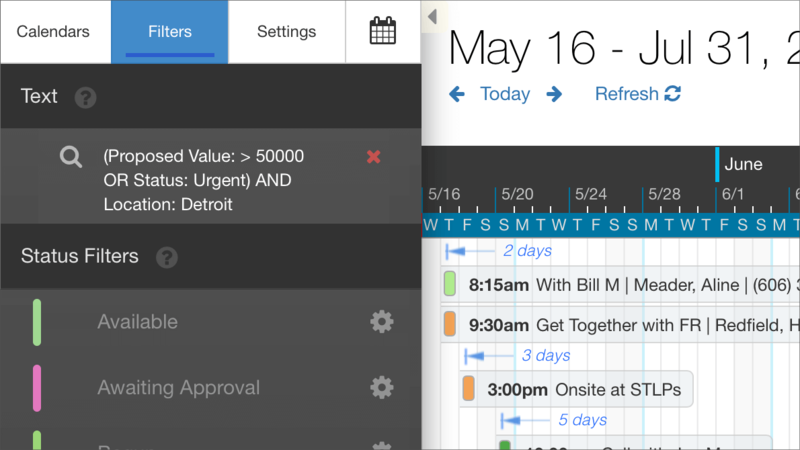 In addition to the built-in status and resource filters, you can filter the calendar by contact and project as well. This is done by adding filter values to DayBack's url in the browser. Note that filters are set in name-value pairs where the name is "filtersProjects" (plural) and the value is "My%20Project" where the space between My and Project is replaced with %20. This means that you can load a given session with just the logged in user's active projects, for example, and they can toggle those on or off to get the specific view they need. Note that this currently won't restrict them from turning *all* their project filters off and then seeing all projects, so this URL filtering isn't for security but rather to help users focus on just the events/projects/contacts they need to work with. Decide which source(s) are visible by including the source in your URL. This is helpful because the source you're interested in might currently be turned off. ...where "Events" is the name of your calendar in Admin Settings / Calendar Sources. If you just pass the name of one or more sources like this, DayBack will add the source to those currently turned on. This null-first behavior works with all the filters which support multiple values. Can I get a list of the active filters from the calendar? What else can I do with URLs? You can also pull up a specific event in the calendar via url: you'd use this if you want to see a particular event in context. To do this, pass in the event's ID, Source, and the date of the event (optionally you can also include the view). DayBack will navigate to that date and bring up the event's popover just as if you'd clicked on it. If the calendar was in a filtered state so that the event wouldn't be visible, DayBack will clear those filters so you can see the event. Note that neither "source", nor "id" actually filter the calendar: they're just used to tell DayBack which event you're interested in. Note that if you're using record types in your Salesforce object, you can constrain a given calendar to a single record type. This would let you create multiple calendars from a single object: each with their own record type. To do this, you'll assign the record type when you're defining the calendar in admin settings: more here.